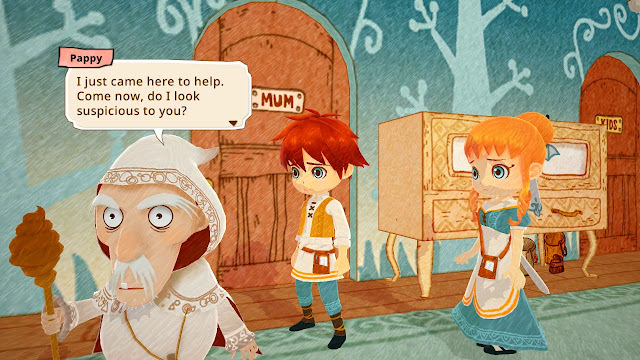 Little Dragons Cafe is a beautifully crafted new adventure game for the Nintendo Switch from the makers of Harvest Moon (a firm favourite in our household). 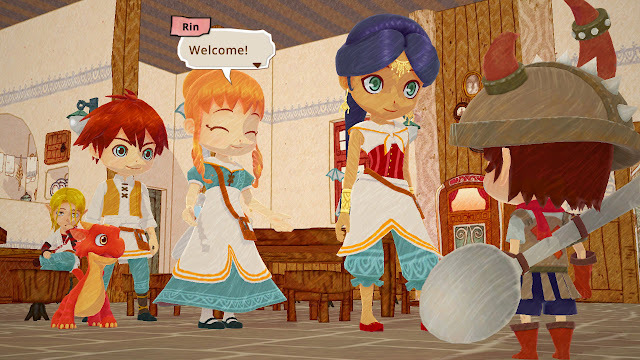 You choose whether to be either Ren or Rin - brother and sister co-owners of the Dragon Cafe - and then set off on your adventure. (You can even change your name as you set off). Your task is to go out and explore and find new ingredients. Then, when a customer comes in to the cafe you have to use those ingredients to rustle up the dish they want. At first, your mum helps out but then she falls into a deep sleep. Now your challenge has changed - you have to find a way to wake her up whilst running the cafe on your own! 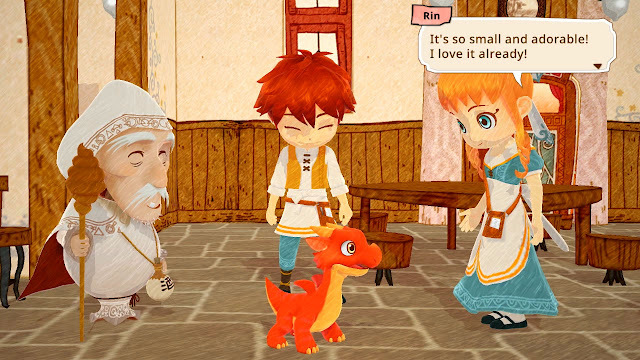 And... you now have a baby dragon to feed and raise! The overall adventure is split into a series of short challenges - each dish is a new game. But they are easy to pick up and great fun to complete. He's recently started his own You Tube gaming channel and loves to make videos of himself playing various games. It's called "Beesley Gaming" and you can find it here. Do pop over and show your support - Despite being only 12 years old, he's been making, editing and uploading the videos all by himself. Back to Little Dragons Cafe...D says: "It's a fun game, with just the right amount of challenge." There's plenty to do, new challenges to experience as the dragon grows, and enough change to keep you entertained for hours. 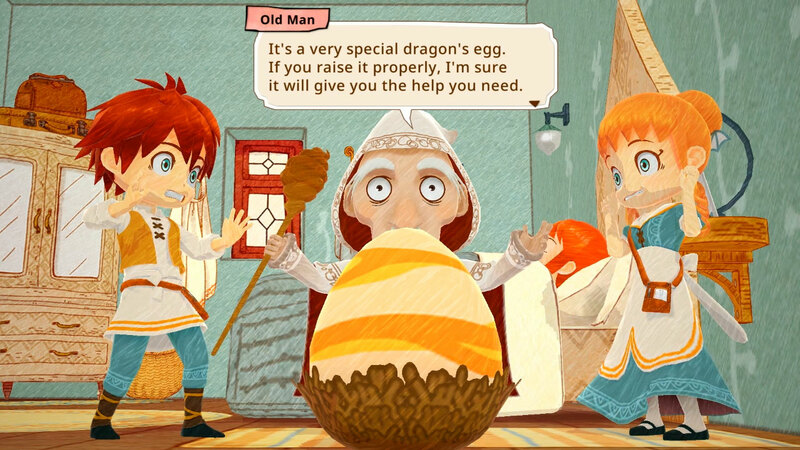 Little Dragons Cafe is available to download from the Nintendo website. For more info, follow Rising Star Games on Instagram, Twitter, Facebook, or visit the official Rising Star Games website. Disclosure: We were sent a digital download copy of this game, to keep for the purposes of this review. All opinions are our own. 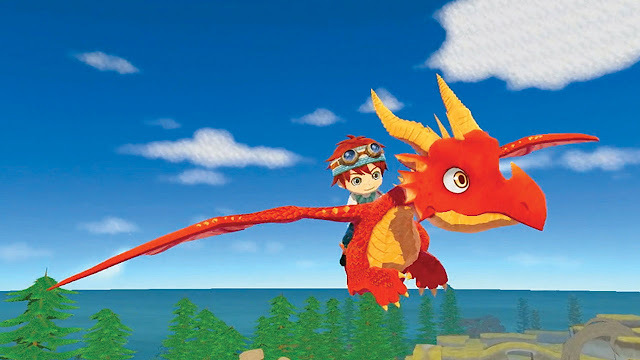 The game is also available on PlayStation 4. 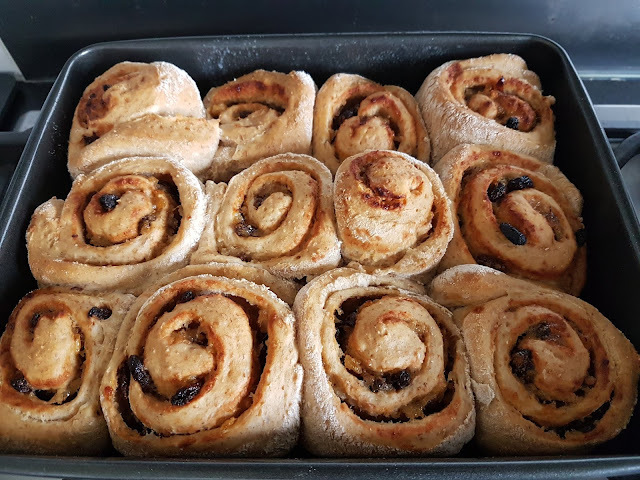 Whilst Ma'mool are supposed to be little bite-sized date pastries, mine have ended up somewhat larger! I will explain why I ended up having to make my ma'mool my way! I love using spices in my baking. Must be to do with my middle-eastern roots. I don't like particularly 'spicy' food but I love the fragrant 'spices' which aren't the hot type. My lovely aunt had sent me these rather interesting teabags from Iran. They are saffron, rose and cardamom tea bags. Three of my MOST favourite spices. But as a tea the saffron just tasted all wrong and I didn't get on well with them at all. But I knew that one day they would come in handy for baking so I put them in my baking drawer and waited...until GBBO SPICE WEEK!!! YAY!!! 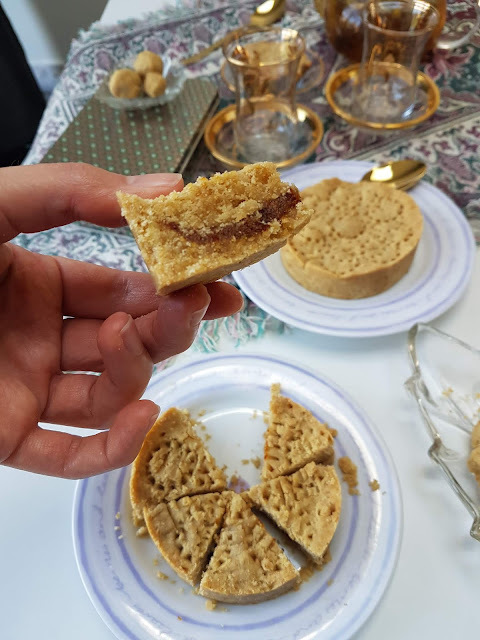 Having never made Ma'mool (or even heard of it) before, I wasn't quite sure where to start until an email pinged into my inbox from Bloomsbury Cooks with a recipe from Yasmin Khan's Zaitoun recipe book for...you guessed it...Ma'mool. 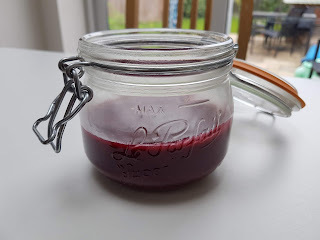 I can't find the recipe anywhere online to link to but as I adapted it a fair bit, I'm going to write up my version here. Basically I halved the recipe and switched up some of the ingredients like using ghee in place of butter and coconut sugar in place of caster sugar and so on. I have Yasmin Khan's The Saffron Tales recipe book but don't yet have Zaitoun so I was glad to have received the email from bloomsbury with the fab Ma'amool recipe. 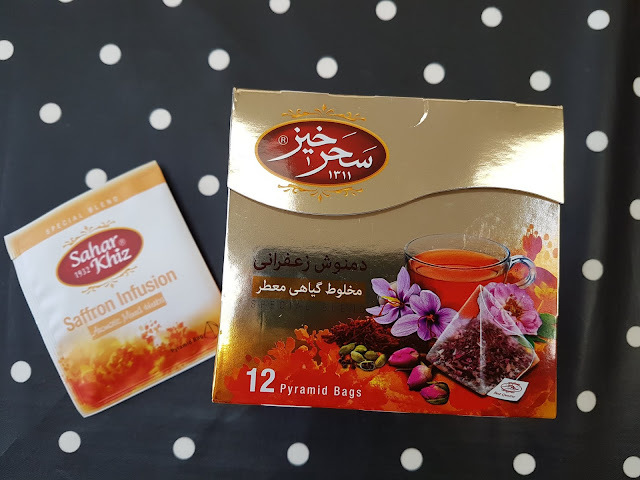 Obviously those teabags are not so easy to get hold of but saffron, rose petals and cardamom are quite widely available these days so you can just use a little of each of those spices instead of needing the teabags. In a food processor blitz together all of the dry dough ingredients together with the ghee to form 'breadcrumb' like texture. Next add in the milk and rose water until it forms a dough. I found the dough to be really crumbly. It needs chilling for an hour before using but as you can see from the picture below, it was STILL really crumbly even after chilling. To make the filling, I blitzed together the dates, spices and the water/rosewater in a food processor until it made a smoothish paste. This also needs chilling for about 30 minutes. 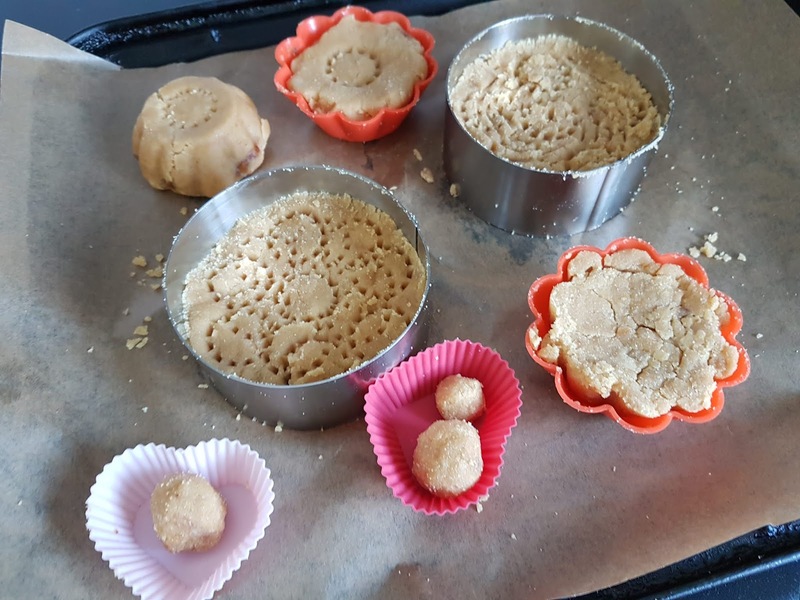 As the dough was so crumbly, I couldn't manage to make the filled balls of ma'amool so instead I made bigger ones by pressing the dough into moulds, filled with the filling and then pressed more dough on top. I managed to prick some patterns into some of them too. I baked them at 180C for 20 minutes. 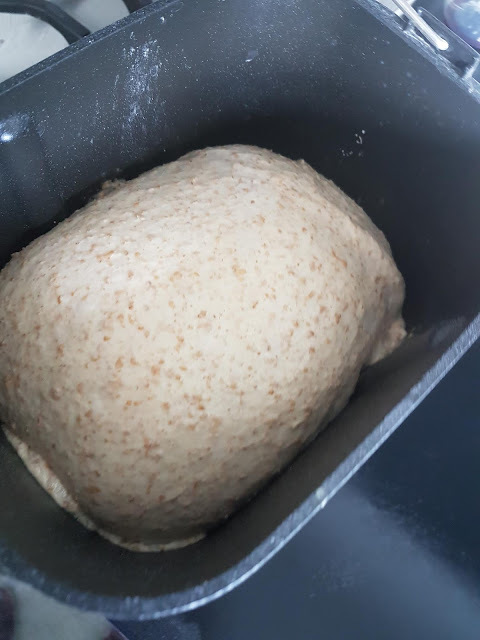 They could probably have done with more filling inside as I had some filling left over and as it is a dry tasting dough, a deeper filling would help bring added moisture to the party. 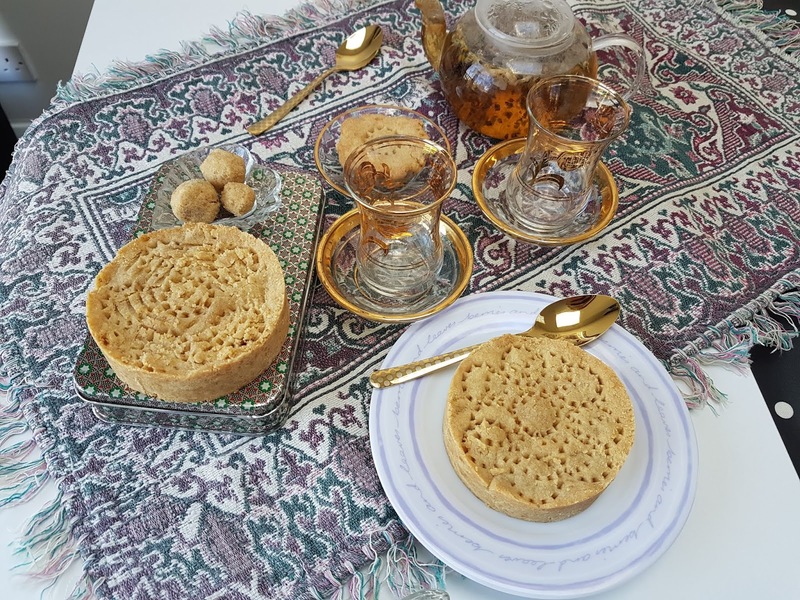 Whilst I'd never eaten Ma'amool before, I have had similar tasting treats like Iranian naan berenji (rice flour biscuits) and noon nochodchi (chickpea flour biscuits) - both with a dry tasting dough and aromatically flavoured. 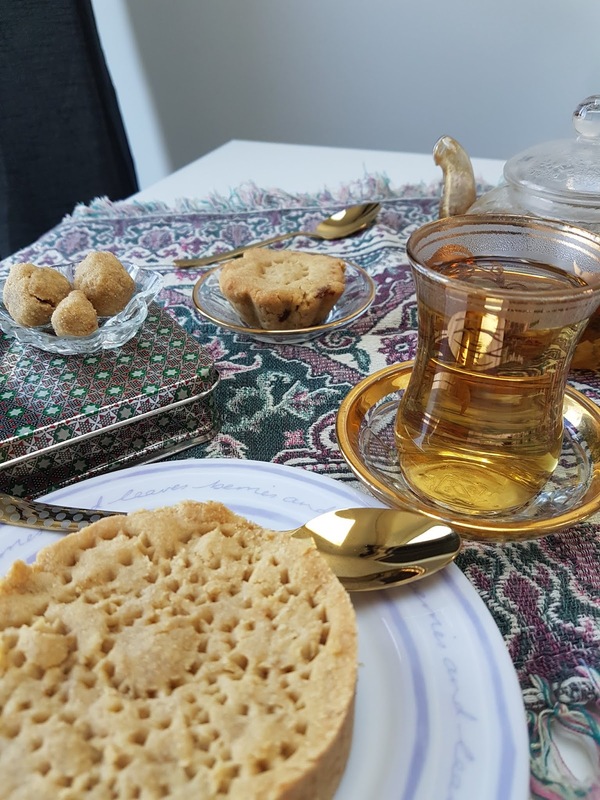 So I can see how these Ma'amool would work really well with iranian style tea. Iranians tend to drink loose leaf tea with no added milk. Sometimes it is delicately flavoured with cardamom pods or rose-petals too. I made a pot of herbal tea with loose leaf camomile, lavender and rose petals to have with my Ma'amool. I found that my Viners eminence gold teaspoons from Maha home worked perfectly with my little Iranian tea cups too. Have you ever meant to send a thank you note for a birthday gift and left it so long that it is now closer to your next birthday than the previous one? That happens quite often to me. The intention is there but time has a habit of rushing by far too quickly to the point that it gets embarrassingly late. And this has become another example of something happening embarrassingly late... 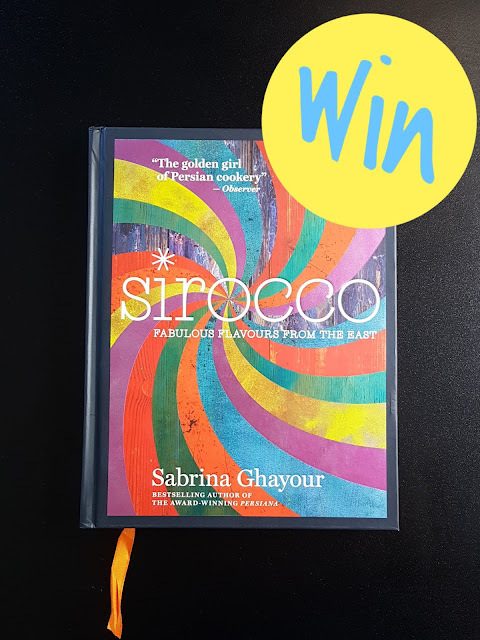 When Sabrina Ghayour's second cookery book, Sirocco was published back in 2016, I actually bought TWO copies of it with the intention of keeping one for myself and hosting a blog giveaway to share the second copy with one of our blog readers. I am a massive fan of Sabrina Ghayour as I believe she has done wonders for bringing Persian cooking to the fore, first with her debut cookbook Persiana, and then with Sirocco and more recently with her third cookery book, Feasts. All the while inspiring us to try eastern inspired cooking through television appearances, at live demos and through her own supper clubs. We had the pleasure of meeting Sabrina back in December 2014 at a Christmas supper club she ran to raise money for Jamie Oliver's Fifteen foundation. The food was incredible, needless to say, and meeting Sabrina an absolute delight. Her passion for food, flavours and cooking was evident to all and combined with her no-nonsense down to earth personality and awesome sense of humour make her an amazing person all round! I've been following her Instagram for all these years and again the way she connects with people is a pleasure to see - responding to questions and comments and always with sincere honesty often lacking on Instagram these days. Little did we know back in 2014 that just a few months later our whole lives would be shaken up with Miss T's diagnosis of Juvenile Idiopathic Arthritis. She was only 2 years old at the time. Having suffered from the same condition myself since the age of 10, I was utterly shocked that all these years later the same comment kept coming up when people heard of Miss T's diagnosis "but I thought only old people got arthritis." Thirty years on and knowledge of this cruel, painful, crippling disease has not increased. So it has become my passion to do all I can to raise awareness of arthritis in children. It is NOT the same as adult on-set Rheumatoid Arthritis and entirely different from age-related osteoarthritis. If left untreated the consequences can be devastating including irreparable joint damage and deformity and even blindness caused by Uveitis which is a condition that children with JIA are at a high risk of. The first step in prompt diagnosis and treatment is increased awareness both amongst the general population and even amongst the medical profession, that children and young people can and do get arthritis. Sadly there is still no cure for the disease but the Juvenile Arthritis Research project, a charity that was set up this year with the core aim of finding a cure, is working hard towards it. And when a young man called Alex (we refer to him as Amazing Alex because the challenge he has set himself is truly mind-blowing) heard of Miss T's condition and the multitude of treatments she needs just to enable her to walk, he decided to do something about it. You may be wondering how all this links to this giveaway? Well the main reason that I just couldn't find time to run the giveaway until now is the sheer volume of appointments and treatments that Miss T needs taking up masses of my time. I've always wanted our blog to be used for good in some way and raising awareness of what Alex is doing seemed the perfect way. So as well as all the usual options on Rafflecopter, there is also an option of heading over to www.give.net/Run250 and sponsoring Alex for his #Run250 challenge. It needn't be a huge amount - as little as £1 will help to make a difference. What is so amazing about what Alex is doing is that it is raising that all-important awareness as well as funds. It is NOT ESSENTIAL to donate to be able to take part in the giveaway. The donate option gives extra entries (so please only complete that option on Rafflecopter if you have donated) but there are plenty of other options to complete for entries too. Please note this giveaway is not affiliated with Sabrina Ghayour, Mitchell Beazley Publishing, or Facebook, Twitter or Instagram. We purchased this product ourselves and wanted to give it away via our blog to one of our readers. The Rafflecopter widget should be straightforward to use, but if you need any more information on how to use Rafflecopter please visit Di Coke's guide. Listed at Superlucky and Prizefinder. Terms & Conditions: (1) Open to UK residents only aged 18 or over. (2) Entry is only through the RaffleCopter form. (3) Bulk or automated entries not permitted. (4) Entries must be received by the closing date (14 October 2018). (5) By entering, you agree to accept and be bound by these rules. (6) The winner will be selected at random from all valid entries. (7) The winner will win the prize as set out in clause (16), and is subject to availability and may change. (8) No cash alternatives. (9) Winners will be notified by email after the draw. (10) Prizes not claimed within 14 days of the prize winner being notified may be redrawn and awarded to a new winner. (11) TheBeesleyBuzz reserves the right to cancel or change the competition or any of these rules at any stage, if deemed necessary in its opinion, or if circumstances arise outside of its control. (12) Winners agree to their names being used for promotional purposes. (13) The judges’ decision will be final, and no correspondence will be entered into. (14) The prize will be sent to the winners' UK address only. (15) The prize will be sent direct by TheBeesleyBuzz using a recognised national carrier. TheBeesleyBuzz can accept no responsibility for loss of or damage to the prize during transit. Should this occur, the winner must notify TheBeesleyBuzz immediately so the issue can be resolved with the carrier. Once received, the prize is the responsibility of the winner. (16) The prize is a copy of 'Sirocco' by Sabrina Ghayour. Can't believe it is already week 4 of GBBO and dessert week. 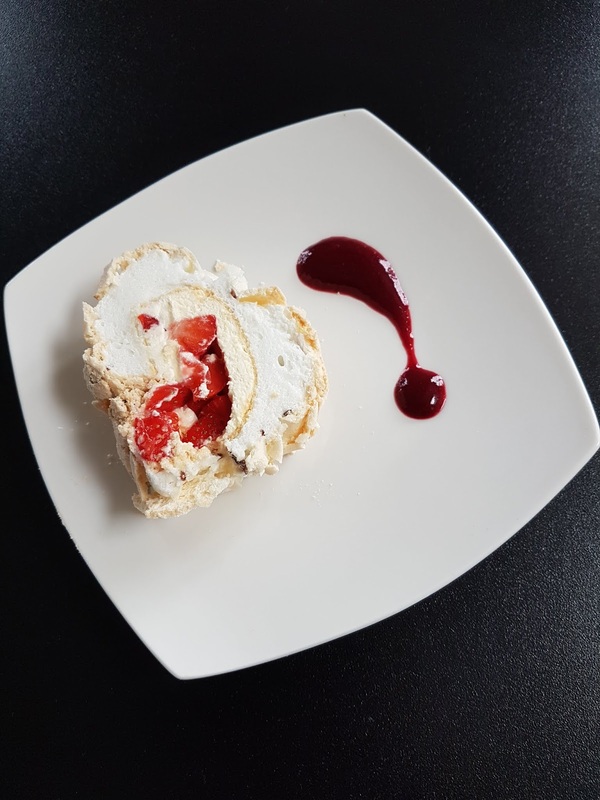 I often start to feel totally out of my depth by this point in the series but I was pleasantly surprised to find myself wanting to try making either a meringue roulade or a raspberry blancmange. 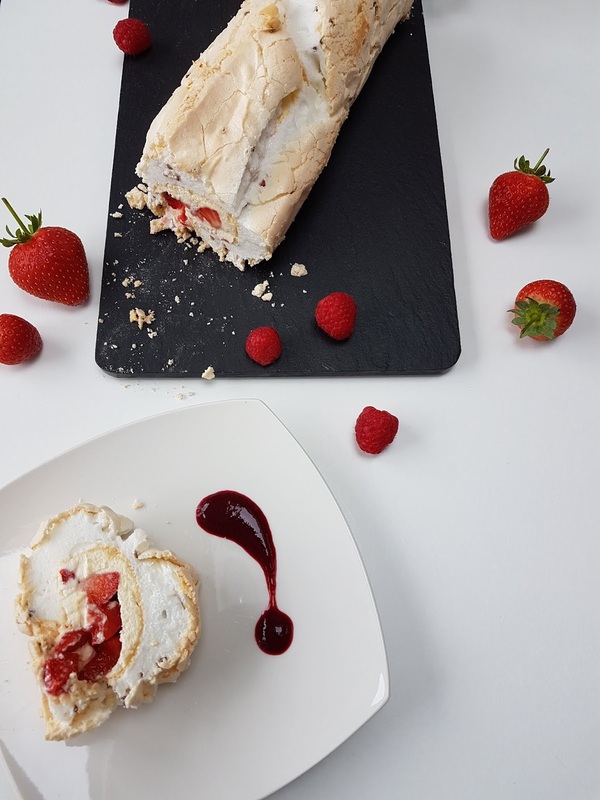 I opted for the roulade as I've made sponge roulade before and I've made meringue before so I figured it was the two combined and that hopefully it may turn out ok. I've called my recipe "triple" raspberry roulade because it contains freeze dried raspberries in the meringue, fresh raspberries inside the roulade and raspberries within the berry coulis sauce I made to go with it. For the meringue I used 4 large egg whites, 225g caster sugar and using a GBBO recipe book featuring the class of 2014 (series 5), I found a recipe for a meringue roulade which also had a teaspoon of lemon juice mixed in with the egg whites and a teaspoon of cornflour added to the caster sugar. I've seen recipes that suggest adding vinegar when making pavlova so I wanted to understand why some recipes suggest adding lemon juice, or vinegar or even cream of tartar. 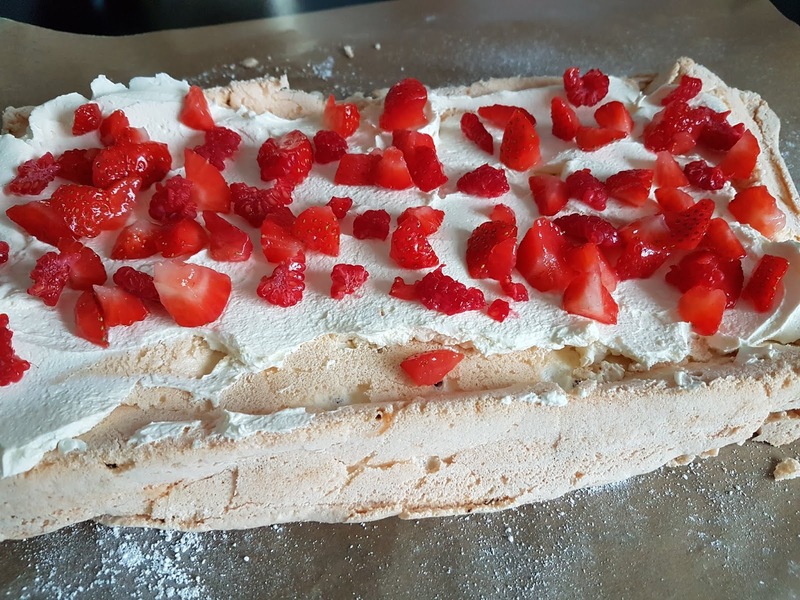 It is apparently because adding acid will help to stabilise the meringue - By delaying coagulation, it allows more time for air to get trapped and so produces a lighter meringue. And the cornflour? Apparently that leads to a softer mallowy meringue. It was a case of whisking the egg whites (and lemon juice) to stiff peaks and adding the sugar (with the cornflour). Then I carefully folded in 2 tbsp of freeze dried raspberries. I then greased and lined a baking tray with baking paper. I was going to use a 27 x 22cm tin but the meringue looked too thick so I scooped it all out and put it in another tin that I thought was bigger - an 18x30 cm tin but it turns out the surface area of that is smaller - doh - maths has never been my strong point. So I ended up with slightly thicker meringue than I wanted. 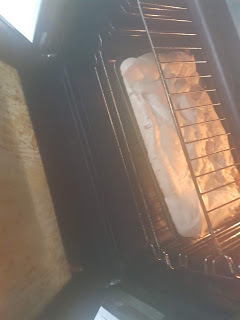 I baked it at 160C for 30 minutes. Then turned it out onto another sheet of baking paper that I had dusted with icing sugar. I left it to cool for 5 minutes before peeling off the original piece of baking paper. Then, being in a hurry, popped it in the fridge to cool completely. I realise this is NOT a good idea as meringue needs to cool gently and slowly to prevent cracking. Whilst it was cooking and cooling I made a berry coulis. It always seems a shame to use fresh berries for things like this when fresh berries taste so nice fresh and whole so instead I used a pack of frozen summer berries. I'm afraid I don't have proper measurements for this but 1 pack of frozen berries (around 330g) with a splash of boiling water on the hob to soften the berries a little. Then blitzed in a blender and sieved to remove the seeds from the raspberries and blackberries. Finally a little icing sugar and raspberry liquor mixed in. 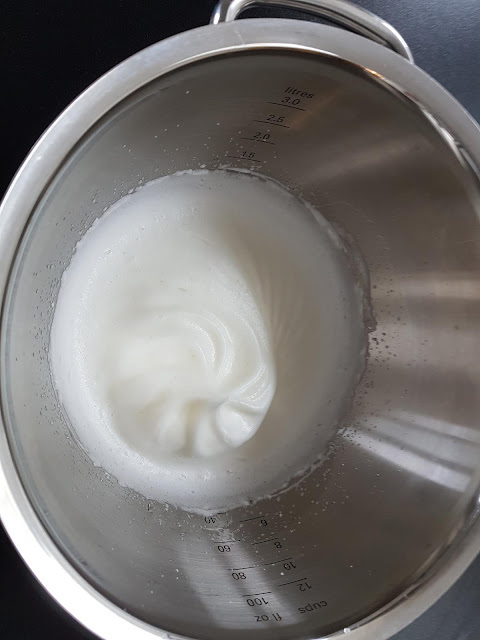 Once the meringue was cooled, I whisked some double cream to make it thicker and spread over the meringue. Then added chopped strawberries and raspberries on top. The meringue did crack but thankfully didn't fall apart. Then rolled! I did use the technique of starting the roll with a slight cut in the meringue and used the baking paper to help me roll it as tightly as I could. Ideally it should have then been chilled again but I didn't have time. It didn't have much of a swirl but there was definitely the attempt of a swirl. 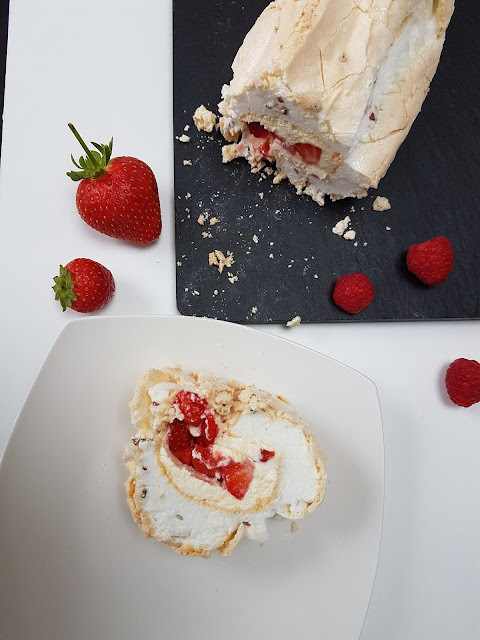 The meringue had the crispy outer and mallowy middle - which I've since learnt is the ideal for meringue roulade - so that was good. Rahul has rapidly emerged as my favourite baker in the tent. Just love how humble he is and his surprise at his own baking - he genuinely doesn't seem to realise just what a talented baker he is. Bread has never been my favourite thing to bake. I'm just not a patient enough person for all that kneading, and proving and waiting and making sure things are done at just the right time so they don't over-prove and collapse or under prove and remain dense. 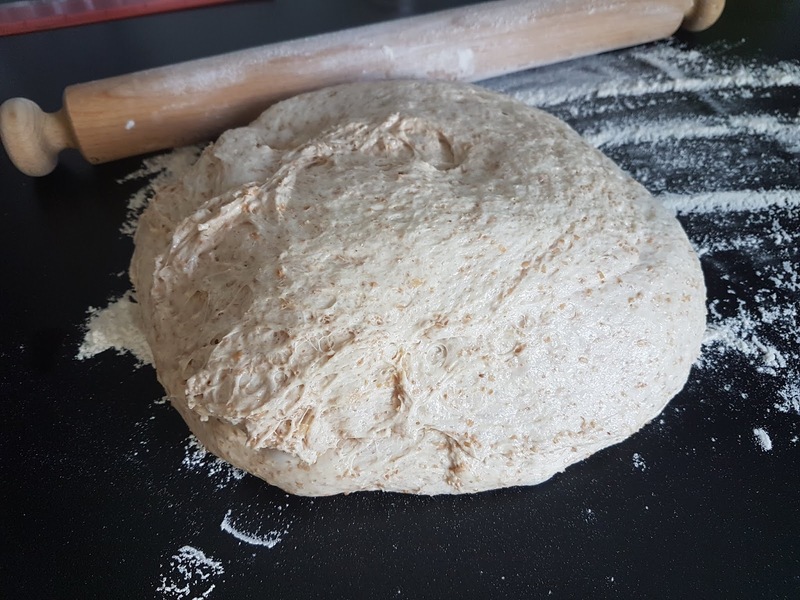 Sure, if I had nothing to do but bake bread all day, then I 'get' that it's therapeutic kneading the dough and satisfying to make your own bread, seeing the magic of the yeast doing it's thing. But it generally doesn't fit into my busy life very well. The only exception being sourdough - which I haven't yet mastered. But I've found it is very forgiving when left for extended periods of time and it fits into my life, rather that the other way round of me having to make my plans around it. Sourdough didn't really lend itself well to any of this weeks bakes though. Possibly perhaps a sourdough naan bread? 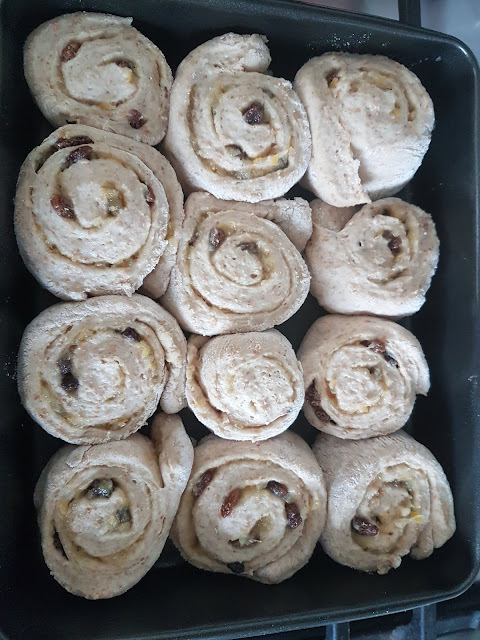 But I fancied making Chelsea Buns. Having made them before using my old bread maker, I knew that I could 'cheat' by making the dough in the breadmaker. I haven't quite got to grips with my new breadmaker though. And when I say 'new' I've actually had it for 2 or 3 years but just haven't used it as much as I used to use my old one. I tweaked the Chelsea bun recipe to make it my own so that was an added variable that I knew I was experimenting with. Leading me to wonder whether this would be my first baking fail of #GBBOBloggers2018. But in went the ingredients and 2 hours and 20 minutes later all was looking good. The dough had risen brilliantly. BUT... I'd ended up with a wet dough that was in no fit state to roll out. Because I'd used 50/50 ratio of strong white flour and stoneground wholemeal flour, I'd added extra milk and water and I guess I'd added too much as I was making it up as I went along. So I used loads more flour to help dry it out. 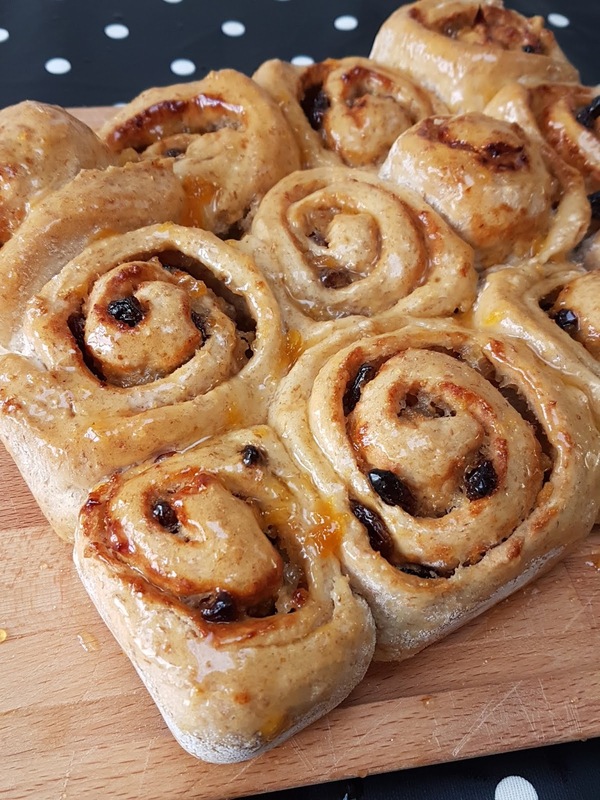 To decide what flavour I would make my Chelsea Buns, I looked for inspiration in my fridge where I found a delicious lemon marmalade that granny had brought back from Italy. So I rolled the dough into a rectangle, brushed with melted butter, mixed together some mixed dried fruit and the lemon marmalade and spread it over the dough. 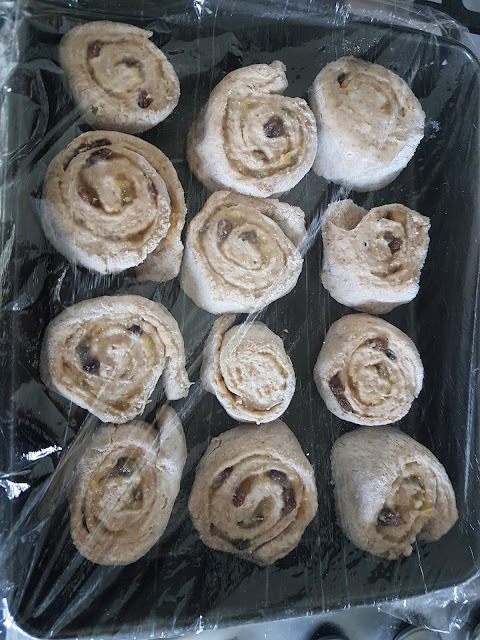 I rolled the dough lengthways and used kitchen string to divide it into 12 pieces. Into the oven at 35C proving temperature for 20 minutes covered in clingfilm and they grew to look like this. Then they were baked at 220C for 15-20 minutes. Then I brushed them with apricot jam mixed with a little hot water. I was pleased that they tore apart nicely. The lemon flavour worked well but overall they tasted a bit too 'bready'. I think I could have added a lot more fruit - perhaps even soaked fruit to add more moisture. Perhaps drizzling icing on top would help with making them sweeter and more cakey? 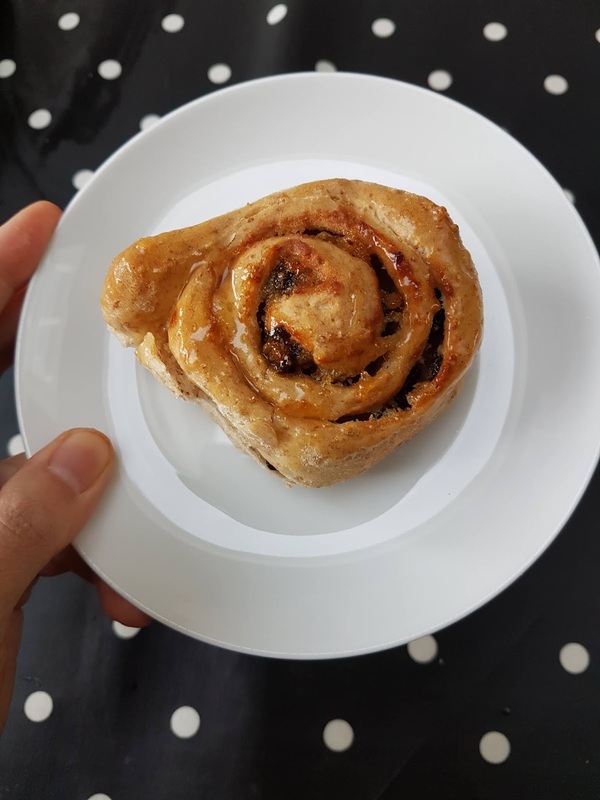 In all honesty, my sweet tooth is a lot less sweet these days so I actually quite liked them myself but I don't think they'd pass as good Chelsea Buns by anyone elses standards. All of the above ingredients went into the bread maker to make the dough. Then the next steps were as I've already described above. 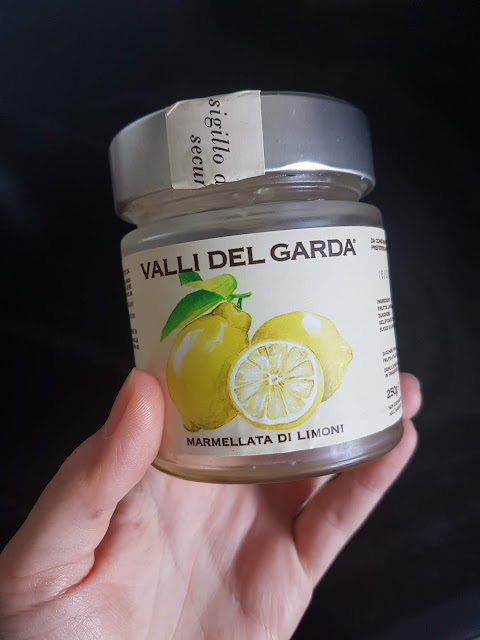 I started with 100g of the lemon marmalade, 50g of mixed dried fruit, and 15g of melted butter then added a bit more of the lemon marmalade and mixed fruit. With hindsight, I should have added even more for more sweetness and moisture. I baked it in an 11 X 9 inch tin which was perfect to fit the 12 chelsea buns in. As at 13th September 2018. Left foot smaller and with high arch. Fifteen months ago, Miss T's left foot started to change. In a very short space of time, it developed a high arch (pes cavus), twisted and didn't grow as the other did. Over the weeks that followed, the changes became more pronounced. She had numerous tests and scans both at Great Ormond Street Hospital and locally (x-rays, MRIs of feet and spine, nerve conduction tests, ultrasounds, more x-rays, more MRIs etc), and met with her rheumatology team, physio and podiatrist. Yet, all this time later, no-one could explain what was going on with her 'mystery foot'. Was it a result of her juvenile arthritis (JIA), or something else? The most recent MRI showed inflammation in the bones of her foot, but suggested this may be the result of the foot being twisted, putting mechanical stress on it, and not the cause of it. Pes cavus is usually associated with a neurological cause. In around 80% of cases, the neurological cause can be found; in the remaining 20% the cause cannot be found (but may still be neurological). Working on everything he has seen, the consultant felt that at this stage a neurological issue is the most likely cause of Miss T's pes cavus. Although Miss T had nerve conduction tests last year, she has not yet had a full assessment by a neurologist. So she is now being referred to one. The original nerve conduction tests were normal, but some types of neurological issue do not give abnormal results - which is why Miss T needs to be seen by a neurology specialist. After the neurologist is done, we will return to this consultant to have follow-ups to see if and how the foot develops over time. So his view is that the likely cause is neurological. Seeing a neurologist will help determine if that is the case. If it is not, then it could be down to the JIA although he said he hasn't come across this scenario of JIA causing pes cavus before. When Miss T first developed JIA, it was her left foot that was most badly affected and it took a while to get the inflammation under control. In theory, it is possible that the JIA damaged the growth plates in her left foot, which is why it is not growing properly now leading to a smaller foot and the pes cavus. We were previously advised that progressive casting (where the foot is stretched and set in a cast, then repeated) was an option. Today we heard that progressive casting does not usually work for a pes cavus. So, depending on how it develops and any symptoms Miss T develops (such as pain when walking), the only option to 'fix' it would be surgery. That sounds scary, but we were reassured that she doesn't need surgery at the moment. Miss T's foot was also described again as a mystery. Return to this consultant to monitor over time. If it gets worse and causes problems, consider surgery. It's only 9.30am as I write this and once again JIA has already dominated my day. Today is not even a 'bad pain day' for Miss T . So getting up and dressed was relatively straightforward today and its just a case of remembering her routine meds. Whilst the suns still shining, I have to remember to smother her in high factor sunlotion and hope that it lasts throughout the school day. One of the side effects of her mtx injections is making her prone to sunburn. Straight after getting Miss T to school I'm on the phone. We're still awaiting outstanding vitamin D blood test results from Great Ormond street hospital. It took several attempts to get her core blood results a few weeks back but for some reason vitamin D results take ages. The blood test was done on 3rd August. Still no sign of the vitamin D result. On the plus side I did get through to the person I needed to speak to straight away. I've been asked to phone back on Friday. Initially I'd been told to ring again last week but as the results still aren't here then it's just as well I didn't. Next it was emails trying to find out about hydrotherapy. Miss T had been attending a local hydrotherapy pool on a weekly basis since her diagnosis of JIA 3 and a half years ago. Sadly that pool recently closed down and despite her local physio, her GOSH physio, her rheumatologist, her local paediatric consultant and our GP all agreeing that she needs hydrotherapy, there doesn't appear to be another suitable pool to be found!!! It's a crazy situation. I don't just mean nhs hydrotherapy, we've been having to pay ourselves for her sessions until now and happy to keep doing so but there just aren't any suitable facilities which permit children for hydrotherapy sessions anywhere around here. It's been over a week of multiple phone calls and emails daily to try to find out if there are any other options for her. Then it's onto next times blood tests. A phonecall to the children's ward - ive tried several times this morning and got an engaged tone. Eventually i get through only to be put through to a different number to someone who tells me to phone back again in 10 minutes. Time to email the community nurse to make arrangements for T's mtx injections for this Friday. A separate email next to the community nursing team secretary to order a new sharps bin as this one is getting full. I'm conscious that we need to allow two weeks notice and I was trying to the in picking it up with the day we are there for bloods but now need to wait until I manage to get her bloods booked in before I know which date that will be. Some happier texts to send after that making arrangements to meet up with a jia friend. So great to find someone of similar age to miss T going through the same thing. They are such great support for one another. Household jobs to get done this morning - just the usual stuff that needs doing every day...washing up, clothes washing, putting dry clothes away. Every. Single. Day. And then it will be time to have an early lunch and get ready for work. In between this, it's back on the phone to get that blood test arranged. Would it really be too much to ask for them to offer to phone me when the blood results are ready or when the person who can book the blood test becomes available. My frustration is growing that not only does Juvenile Arthritis dominate our lives directly with the impact it has on miss T's body and the medications and doctors appointments but that the inbetween times are also dominated by sorting things out. I know that doctors, nurses, and hospital staff do their very best and are already stretched in so many ways. But So are parents of chronically ill children. So that was just this morning. We also have physio exercises to fit in daily which we just didn't get a chance to do before school today. And the rest of the week includes another consultant appointment trying to get to the bottom of her mystery foot. So evenings have been spent pulling together all her scan results, copies of reports etc to have them ready for Thursday for this new doctor to review. I'm just feeling like an elastic band at full stretch at the moment and I know I don't have the liberty of snapping because my family need me. I’m not that familiar with making traybakes – I haven’t worked out the ‘science’ of it – can any cake recipe be baked in a square/rectangular tin and be called a traybake? Are some types / flavours of cake better suited to being baked as a traybake? 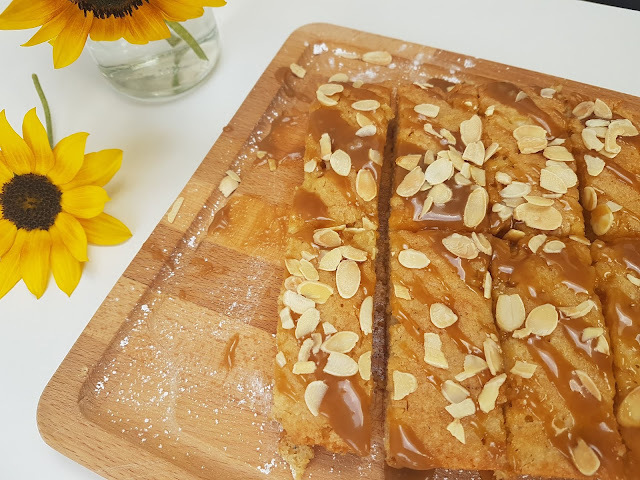 I’m clueless about it all but of the 3 GBBO challenges for cake week, the traybake seemed the most manageable for me given my track record of baking fails and disasters. 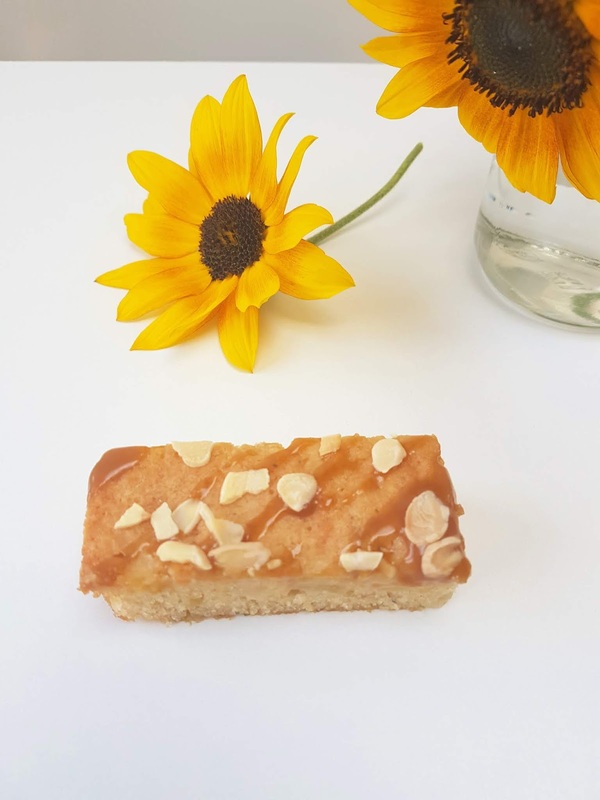 So I decided I was going with an autumnal vibe and settled on making “An apple, salted caramel and popcorn traybake” but somehow have ended up with a “Pear, Cardamom and Caramel” traybake. 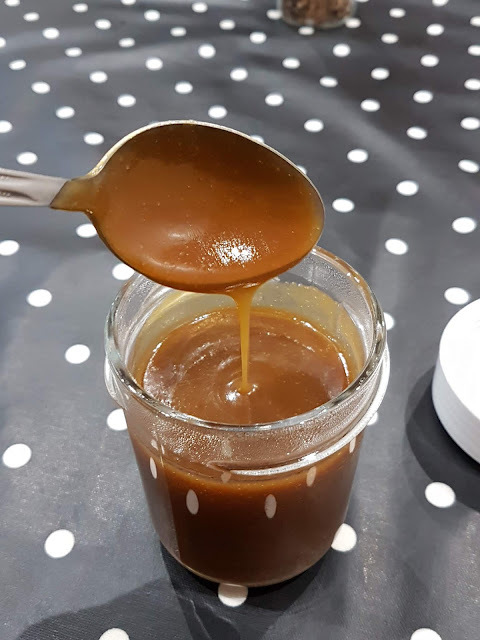 Caramel was super easy to make and at the last moment I decided not to add salt to it so just ending up with plain caramel rather than salted caramel. I used the Salted Caramel recipe at BBC good food (but without the salt). Next I was going to use some of the apples I had picked, stewed and frozen from my little apple tree in the garden – but then I found I had a couple of pears lurking in the bottom of the fridge so apple became pear and just to add a bit more interest to it I ground up some cardamom seeds and added that in – about half a teaspoon. 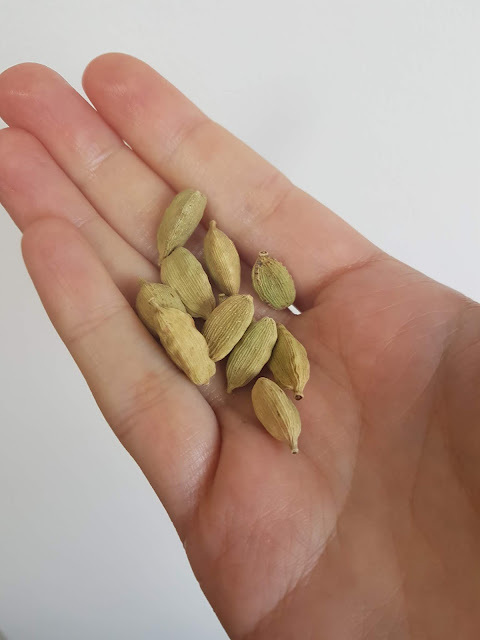 To make ground cardamom from these green cardamom pods, I gently crushed them in a pestle and morter to remove the outer skin and then more vigorously crushed the seeds to grind them up. I’ve always said if heaven has a scent, it smells of cardamom! I can’t get enough of it – although I know that too much of it can end up tasting a bit overpowering and almost medicinal. So here is the final recipe I ended up with for my Pear, cardamom and caramel traybake. 1. Pre-heat oven to 140C (fan). If you don't have a fan oven then it needs 160C. 2. Grease and line your traybake tin with baking paper. I used two tins of 7.5 X 8.5 inch. 3. 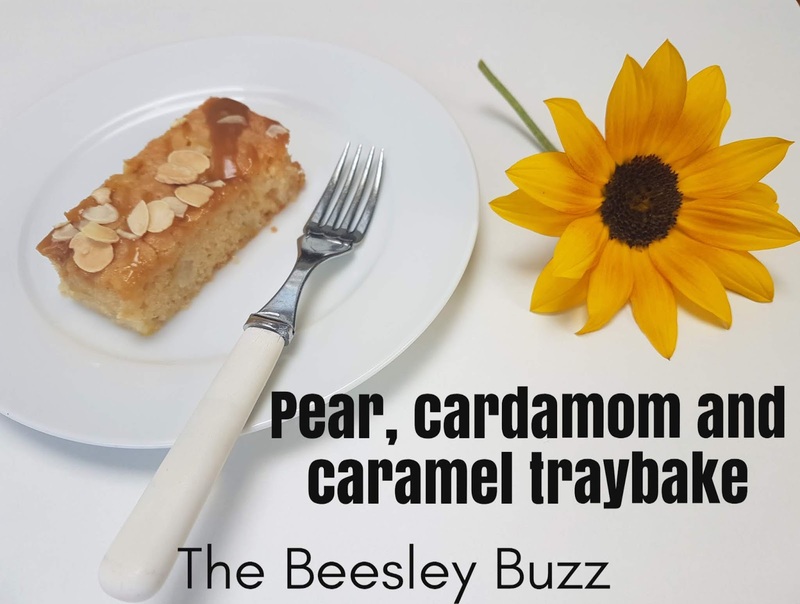 Mix together all of the ingredients except for the pear, flaked almonds and caramel sauce. 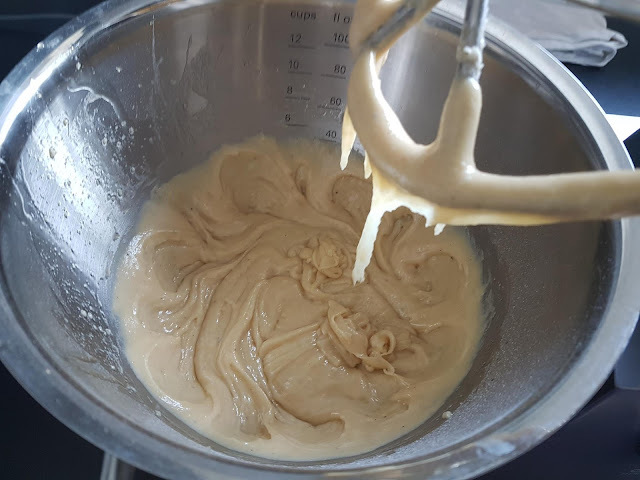 The batter looked more of an 'oily' texture than I'm used to for cake batter - almost like the texture of choux batter. 4. Remove the cores of the pears and dice the pear into fairly small cubes. Add to the cake batter and this time mix in by hand. I didn't want the pear to get completely squished in the mixture but to remain as small chunks in there. 5. Divide the batter between the two tins and bake in the oven for 40 minutes (until a skewer comes out clean). 6. Leave to cool then remove from tin and drizzle with caramel sauce and sprinkle with toasted flaked almonds. I was curious to see if it would cut cleanly into pieces as was required on GBBO this week and thankfully on the whole I was able to get neat-ish slices. Having made two small traybakes rather than one large one, I took one to work and we had one at home. I don't think I've ever received such great compliments on my baking! I have to say I surprised myself at how well they turned out and how great the flavours worked together. After playing it safe with last weeks bake and not adding any twists or unique flavours to my Cornish Fairings last week, I felt pleased that my made up flavour combo really worked well this week! I'm so thrilled that GBBO is back! 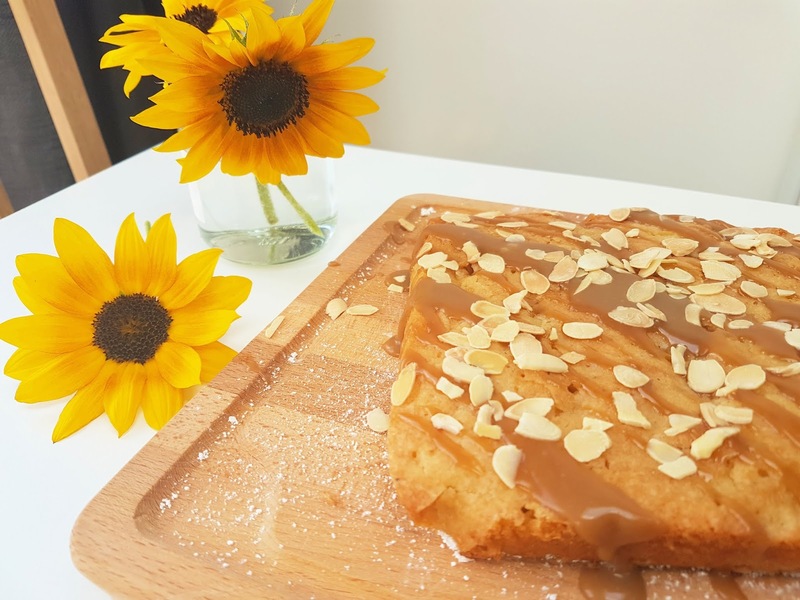 It's the one time of year I really try to get back into baking and blogging again in an attempt to join in with a few of the bakes over the coming months. This year, week 1 was biscuit week. With the first challenge being a regional biscuit with your own signature twist. The technical was wagon wheels which I wouldn't have a clue where to start! And the show-stopper 'a biscuit selfie set in a place special to you - involving layers of biscuit to make a 3D effect' - eek - I wasn't going to try that either. So I stuck with the first challenge of a regional biscuit. 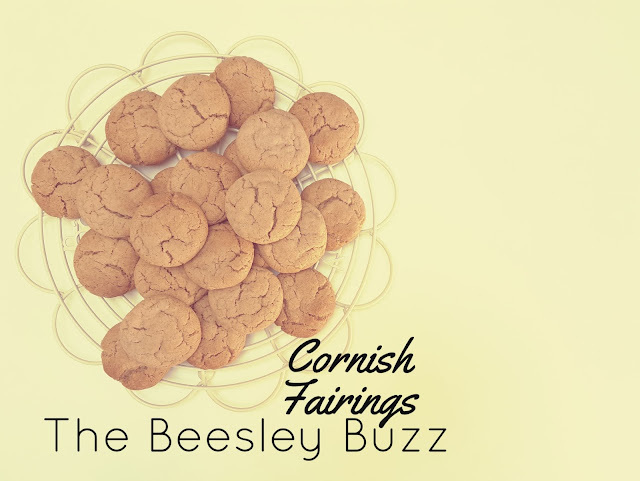 I decided to make Cornish Fairings because we loved them so much when we first came across them on holiday in Cornwall several years ago. We fell in love with Cornwall so much that we were back again the following year - twice in fact - staying at the wonderful Sands Hotel. As I'd never baked these before, I wasn't brave enough to give them a personal twist of my own but did think that they would be great partly dunked in dark chocolate? or perhaps with a layer of custard cream sandwiched between them, or possibly even coffee liquer cream sandwiched inside??? So although I didn't add these twists, it gave me something to think about for next time I make them. 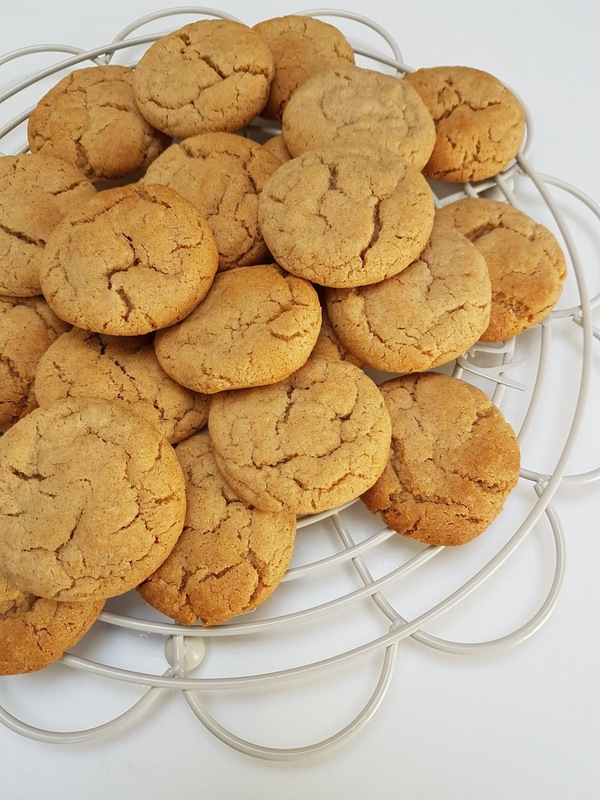 I used the Cornish Fairings recipe from Paul Hollywood's British Baking recipe book. 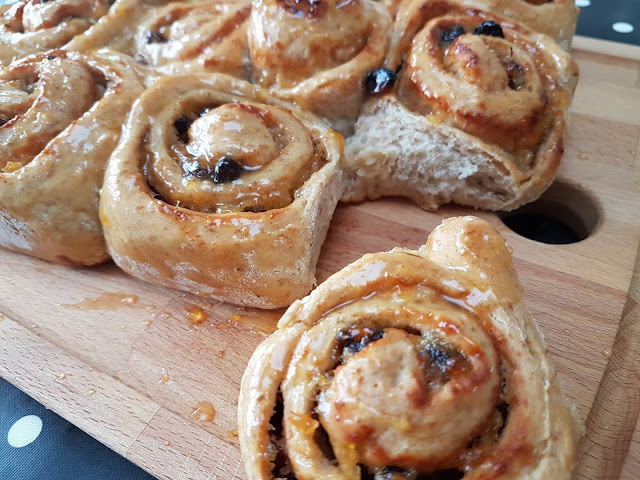 I haven't written the recipe here as I haven't asked permission to and don't want to infringe any copyright but I have found it online elsewhere in case you do want to see the recipe. I stuck closely to the recipe and even though the mixture looked dry like it might not come together, I resisted the temptation to add more milk and it did hold together just fine. 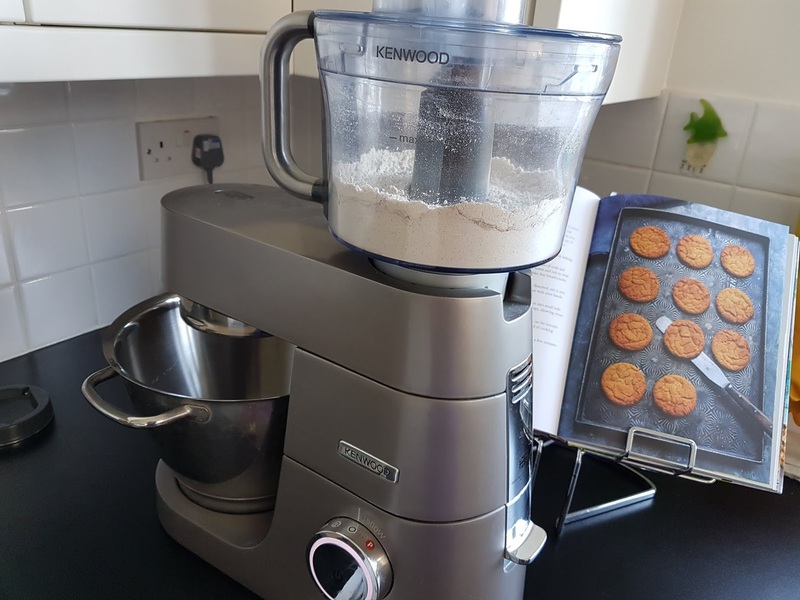 The only exception to following the recipe that I made was by using my trusty Kenwood chef to blitz the dry ingredients together with the butter into a mixture resembling breadcrumbs rather than to do it by hand. I have to admit that this is my kind of biscuit baking. Apart from getting a bit precise over making them equal (which I wouldn't normally bother to do), they are a really easy biscuit to make. There's no faffing about with chilling the dough or rolling it out or cutting shapes. 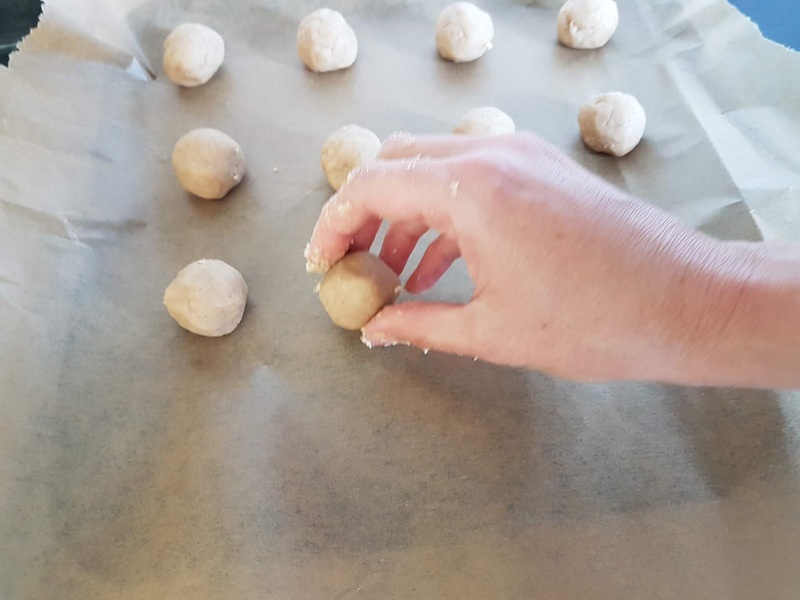 Just simply roll pieces of the dough into balls and place on a baking tray and 10 minutes in the oven and they're done! They turned out slightly thicker than I expected and slightly less crunchy. I think that by either flattening the balls slightly and/or using less golden syrup should help make them more crunchy in future. I was really please I got the cracked-top effect which apparently is from using baking powder in the recipe. Overall I was really pleased with them and I think they'd make a fab little gift too - just imagine them in little stacks wrapped with cellophane and ribbon. 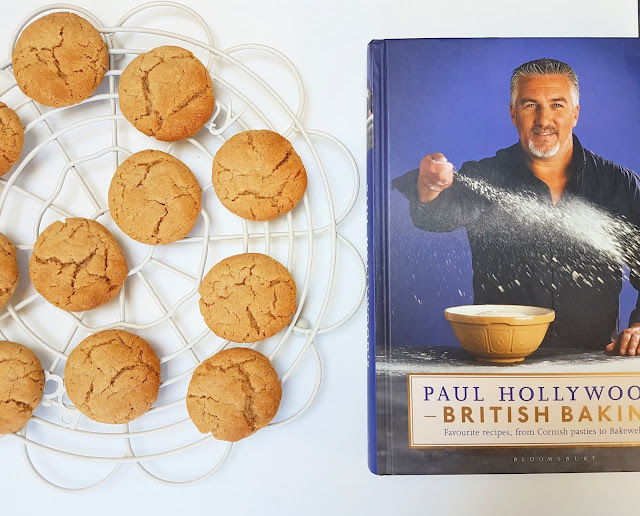 I'd love to try them with variations in future - I love the sound of these ones with lemon and orange peel in from the Happy Foodie or how about these ones on Great British Chefs with a gorgeous cream cheese mousse sandwiched between them. 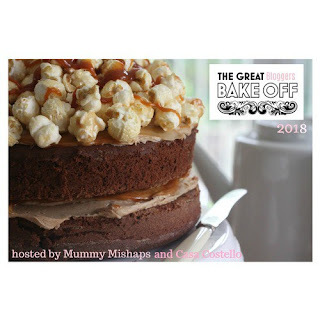 Massive thanks to Mummy Mishaps and Casa Costello for hosting this years GBBO Bloggers Linky! I'm so happy to see this linky back.